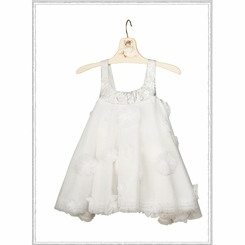 Wispy rosettes dot the gossamer mesh overlay of a twirly trapeze dress trimmed with shimmery silver straps. Fully lined, with ruffle-trimmed petticoat for fullness. Polyester; hand wash.